I used Firefox when it was initially released about 15 years ago, but migrated to Chrome a few years later. A couple of weeks ago, I tried Firefox over a few days. Here’s what I found. I’m trying out Firefox now on desktop and Android. Will see how I go. So far I haven’t found a way of continuous synching of Firefox and Chrome without plugins. On my desktops at home (Win7) and work (Win10), Firefox feels about as fast as Chrome, except for Gmail, but I think I’m seeing the effects of the new Gmail interface, which I switched to a day before switching browsers – this seemed slower than the old interface in Chrome as well. It seems to run fine on my Android phone. Again, was able to sync via the Firefox account. Easy to set Android to open FF by default. Possibly a bug in FF – on my work desktop, if I maximise the browser window on one of my monitors, the navigation all disappears. It works on the other monitor, and at home. — This is not a FF bug – Chrome, IE and Edge are all doing it. Probably be a graphics driver issue. …at some stage a Windows Update came through and seemed to fix this. One issue I’m seeing with Firefox: looking at Youtube, the options to embed a video have disappeared. Instead, the Share option will only let you send a Youtube message to somebody with the video link. Tried Edge/Chrome on the same video, and they’re appearing. (It’s one of my own videos, so the option to allow sharing is definitely on). So it seems Firefox appears to be doing something funny. I wonder if it’s trying to render a simplified (mobile-like) rendering of the page, though I can’t see an option for turning that off. Eventually I found the Embed option. The navigation to it is totally different from within Chrome and Edge, making it difficult to find. Then I started to see similar issues on carsales.com.au… hmmm. I’ll keep FF on the work PC for my own development, but won’t use it as my usual browser. For those sticking to Chrome but unhappy with the privacy defaults, there are a few tweaks that can be made, though who knows how effective they really are. This entry was posted in Internet, Mozilla and tagged Mozilla Firefox on Wed 2018-07-18 by daniel. If you’ve got next to no memory and CPU available to run a Minecraft server, don’t fret. Cuberite is what you’re after. At them moment, Cuberite isn’t bug-free, nor indiscernible from a genuine Minecraft server, but it’s quite usable – and instead of needing 4GB+ of RAM, it needs less than 300MB. And it needs next to no processing power: some people run Cuberite on their Raspberry Pi and have plenty of CPU available. I would at this point go on about how this is a significant point of difference between C++ and Java, but Java optimizes for something different to C++. I got into an interesting discussion with Cathy about this after reading a question someone had about what Java was trying to be good at. I used to think that VB was the new COBOL, but clearly Java is the new COBOL; those Java programs are going nowhere, they’re verbose and easy to understand and maintain. A point to note: The Minecraft protocols are bandwidth heavy, I found if I wanted to run a server at home I’d be able to have one, perhaps two players. Thus is Internet in Australia. Instead I’ve dropped this onto a free AWS VPS instance and bandwidth is no problem. ; Please restart Cuberite to apply changes made in this file! Changing these permissions doesn’t affect apache2’s ability to get them. The reason we’ve used a group here is to allow both Cuberite and any other app (for example, exim) to access the private keys; just add any other user that needs to use the private keys to the privkey_users group. If not, you can check in the logs directory to see what’s wrong. should be secure. Note the https is mandatory, as your browser will use http if you fail to specify a protocol. This entry was posted in Games, Hosting, Linux on Thu 2017-05-18 by josh. The email authentication technologies we’re about to implement are, according to the authentication authorities, all you need to be regarded as being from your domain when you send email, and someone else not being from your domain. Effect: your emails can be considered trustworthy by email receivers who use these technologies. If they don’t use these technologies, they can’t tell. At the very least, Google will be less likely to think your email is spam. A PTR record can be obtained from your host’s nameserver – it’s a reverse DNS record for your IP address. If the PTR record points at ec2-23-65-53-221.ap-southeast-2.compute.amazonaws.com rather than example.com (your domain), and you’re claiming to be sending mail from example.com, what’s the email recipient meant to think? will tell you what the host for that IP is. Lodge a ticket with your hosting provider and get that PTR record changed to example.com. This might take about a day. TXT @ "v=spf1 a mx -all"
This says “for my domain, I will only send email from IP addresses listed on the nameserver”. Nameserver changes take time to propagate. After your nameserver changes have propagated, you can go to https://dmarcian.com/spf-survey/ to check out if you got it right. That all goes into one nameserver TXT record, spaces and all. The world will join up the ” ” and get one big string. Note the bold number up there? That’s the selector. That a number needs to get larger with each new key. Periodically you’re going to have to reissue your key because security. You know what gets larger as time goes by? The date. Use the date. If you screw up, use tomorrow’s date, etc. After an appropriate delay for nameserver propagation, use https://protodave.com/tools/dkim-key-checker/?selector=20170419&domain=example.com to check your work. Domain-based Message Authentication, Reporting and Conformance is where the wheels can come off if you screwed anything up. We’re going to set things up so that when you screw it up, computers scold you rather than putting your emails in the bin. _dmarc.example.com. 1800 IN TXT "v=DMARC1;p=none;pct=100;ruf=mailto:dmarc_failures@example.com;rua=mailto:dmarc_summary@example.com"
none is the consequence for screwing up. none is where we’ll start at, and see what the reporting records say to us. After a while, you’ll be comfortable that everything is ticking along nicely, and you’ll up the consequent to quarantine (shove it in spam) or reject (burn it). After your nameserver changes have propagated, you can go to https://dmarcian.com/dmarc-inspector/ to check out if you got it right. This entry was posted in Email, Encryption, Hosting, Spam on Tue 2017-04-25 by josh. For those of you following along at home, this is part of a cookbook style instruction set for getting spamgourmet going, but because of screwed up permission logic I can’t post this section there. Now the captcha server will start whenever the computer starts. This entry was posted in Email, Hosting, Linux, Spam on Mon 2017-04-24 by josh. mod-perl is an Apache module that allows Perl programs to be executed from Apache. If you have multiple sites, you’ll want to do things with DocumentRoot to isolate them from each other. But that’s for another post. You might add in DirectoryIndex /index.pl to make http://www.example.com/ execute your program. The Directory section above allows you to isolate executable code from served code, which is good practice. For this example we’re dumping the executable in with everything else, which is questionable. Repeat this process for any other domains you host. Punch holes in your firewall for ports 80 and 443. Navigate to http://www.example.com/index.pl to check all is okay. You ought to see Hello World displayed for your website. Having security used to be a pain. SSL certificates signed by a recognised CA cost money, and then you’d have to keep them up to date, and there wasn’t process automation, so you’d do all that stuff by hand. LetsEncrypt address all these problems, handing out free certificates and scripted everything. This entry was posted in Deployment, Hosting, Linux, Privacy, Site admin on Wed 2017-04-19 by josh. Here we are on a Debian Linux, such as Ubuntu and we want to run a mail server. Exim4 is currently the most popular email server, but getting it up and working for free is a hassle – who wants to pay for a SSL certificate, on an ongoing basis? And then there’s the maintenance of the security of it – constant renewal, renouncing and re-installation of the certificates. ifconfig | grep "inet addr" | grep -v "127.0.0.1"
Once you’ve got that handled, punch a hole in your firewall so that port 25 can get through from the outside world to your machine. Be aware: the outside world is filled full of botnets trying to hack into your machine. After installing exim, keep an eye on the logs in /var/log/exim4/ for a while. Now we have a mail server, the world needs to find it. Check your nameserver setting to ensure mail is destined this machine. You probably want only one MX record. 2017-04-16 09:13:24 TLS error on connection from your.home.ip.com (IcePlanet) [5.6.7.8] (cert/key setup: cert=/etc/exim4/exim.crt key=/etc/exim4/exim.key): Error while reading file. The reason we’ve used a group here is to allow both exim and any other app (for example, a secondary service that wants to use 8080 to serve up a configuration page) to access the private keys; just add any other user that needs to use the private keys to the privkey_users group. 2008-06-03 08:27:35 TLS error on connection from me.at.home.com ([1.2.3.4]) [5.6.7.8] (cert/key setup: cert=/etc/ssl/certs/server.pem key=/etc/ssl/private/server.key): Error while reading file. There shouldn’t be any obvious complaining. This entry was posted in Email, Hosting, Linux, Network, Privacy, Security on Sun 2017-04-16 by josh. I found another very uefsul behaviour this morning.I don’t touch off when I get home at night. While, this seems weird how do they know I got off in Zone 1 (for which I have a pass) and didn’t travel into Zone 2 (for which I should be charged Money)? But, the fare manual says that if you have a MyKi Pass and you touch on in a zone for which that pass is valid (Parliament in my case) then there is no default fair.So, every morning when I touch on, it tells me deducting fare for previous trip . Which is $0.00. Cool.This morning I forgot to touch on some power issues on our line, got to chatting with the Station Hosts, just forgot. When I got to Parliament, I fully expected the gates to deny me egress and I’d have to do the silly thing where you act exasperated and they just wave you through the end gate even though you’re holding nothing but a wallet in your hand (MyKi works while in the wallet).BUT, it let me through. Seems that it’s happy enough that I started a trip (at Parliament) last night, spent 16 hours travelling and ended my trip back where I started. So it let me out basically a touch off of the trip home last night.Bizarre. But uefsul. At first glance, it looked on-topic. But I was suspicious because the user link was to facebook.com/profile.php?id=XYZ (I’ve removed the ID) — and it came in the middle of a bunch of other (less-relevant) comments linking to similar URLs. I found another very useful behaviour this morning. I don’t touch off when I get home at night. While, this seems weird – how do they know I got off in Zone 1 (for which I have a pass) and didn’t travel into Zone 2 (for which I should be charged Money)? But, the fare manual says that if you have a MyKi Pass and you touch on in a zone for which that pass is valid (Parliament in my case) then there is no default fair. So, every morning when I touch on, it tells me “deducting fare for previous trip”. Which is $0.00. Cool. This morning I forgot to touch on – some power issues on our line, got to chatting with the Station Hosts, just forgot. When I got to Parliament, I fully expected the gates to deny me egress and I’d have to do the silly thing where you act exasperated and they just wave you through the end gate even though you’re holding nothing but a wallet in your hand (MyKi works while in the wallet). BUT, it let me through. Seems that it’s happy enough that I started a trip (at Parliament) last night, spent 16 hours travelling and ended my trip back where I started. So it let me out – basically a touch off of the trip home last night. It seems the spammers are trying to get a bit more clever at sneaking their comment posts past moderators. I still don’t know why, given WordPress has used NoFollow on their comment links for about ten years now. This entry was posted in Spam, Wordpress on Tue 2015-11-24 by daniel. TL;DR: 1024 bit DH keys can be broken, so you should configure your browser not to support them in SSL/TLS. This entry was posted in Internet, Security on Wed 2015-10-28 by daniel. Yeah, no, this is spam, and it sounds like quite a few people are getting them. Cotap was formed by former Yammer people… there’s speculation that when they left Yammer, they took a copy of the Yammer email list with them. @andrhamm Do you use Yammer as well? I wonder if there's a connection between using Yammer and getting spam from the ex-Yammer @cotap guys. @andrhamm Very interesting. The email-address used by Cotap was the one I used for Yammer. And its not registered anywhere else. In any case, don’t fall for their trap. Don’t do business with spammers. In fact, why on earth would you trust your business messaging to spammers? This entry was posted in Spam on Thu 2015-09-17 by daniel. I don’t know how much bandwidth Twitter’s new autoplay videos are burning up, but fortunately it can be turned off. This entry was posted in Microblogging, Social networking, Twitter on Wed 2015-07-01 by daniel. Just… just… wrong. So wrong. 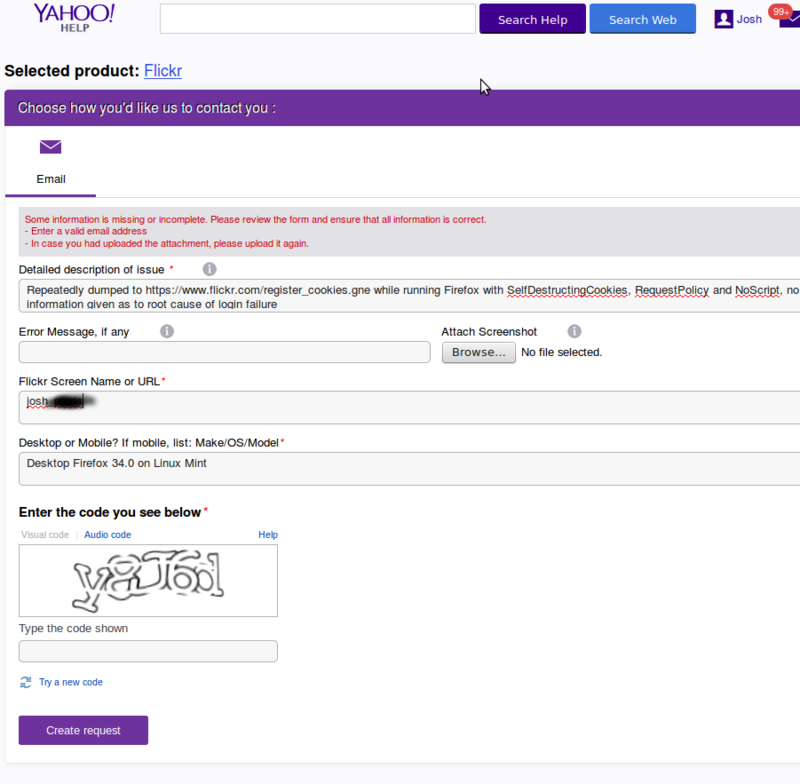 Firstly, note the error message “Enter a valid email addresss”. Where, pray tell, ought I do this? Why do I need to upload any attachment again? Why do I have to prove I’m a human time-after-time, when all I’m doing is wrestling with your completely broken attempt at a web form? Have they noticed that no-one is submitting help requests via this form, what with its refusal to accept said requests? Dear Flickr: stop sucking balls. This entry was posted in Images, Site design, Web pages on Fri 2015-01-30 by josh. Where did I take that photo? I couldn’t find anyone extracting out the geolocation geotagging EXIF data from their photographs so they could pull it up on something like Google Maps. There are stand-alone programs with embedded maps, but the bits and bobs lying around on the average system ought to be enough to just generate a URL to a mapping website. The following bash script echoes the URL that geolocates your JPEG. Because my camera doesn’t emit it, I couldn’t be bothered dealing with the seconds part of a location, but I did detect that you don’t have a camera the same as mine. Drop a line if you’ve used this and fixed it. echo "Script does not support seconds being specified"
This entry was posted in Code, Google and Gmail, Images, Linux on Thu 2014-02-27 by josh.